A Beautiful Heart Pendant set in 14k white gold with a single diamond accent on top of a heart-shaped 0.65 carat amethyst gemstone. Includes 14K White Gold Singapore Chain. 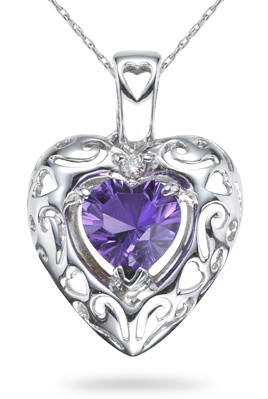 We guarantee our 0.65 Carat Amethyst Heart Pendant, 14K White Gold to be high quality, authentic jewelry, as described above.